A book for cooks as well as seasoned and armchair travellers in which Anissa brings together some of the most memorable food in the world – everyday delicacies sold by street vendors or in simple shops. Interspersed with fascinating stories of her food adventures across the continents, Helou offers definitive recipes for favourites like Spanish tortilla, Italian panini, Morroccan tagines, Egyptian ful medammes, Turkish kebabs, and French pan bagnat. Each recipe offers a delectable window into the rich food world of the Mediterranean. 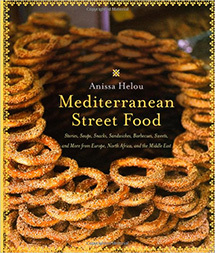 Mediterranean Street Food was recently chosen by Cooking Light as one of the 100 best cookbooks of the last 25 years.